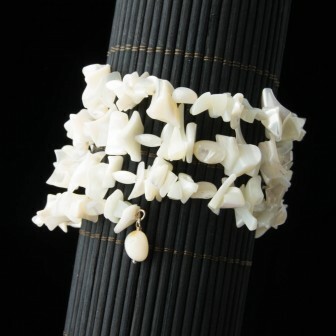 Simply elegant, this white mother of pearl wire wrap bracelet is a stunner! The beads are absolutely iridescent in their beauty. This one has taken permanent resident on my own wrist! Be sure and take a look at a few different choice’s of matching earrings here, or here for your complete look. Along with our fabulous necklace’s. Here’s one of two options.